1. To moderate the intensity of something or to make it decrease: It is hoped that the wind will abate after the storm. Instead of leaving right away, Marge and Mack decided to wait until the storm abated before going on their hike. 2. To suppress or to end a nuisance, act, or writ: Carl's neighbor finally abated the loud noise created by the music that was being played earlier in the evening. 3. Etymology: from Old French abattre, "to beat down"; from Latin ad-, "to" + battuere, "to beat". 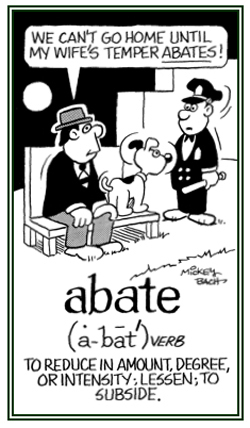 Abate generally means "to lessen" or "to decrease" in some way, but it may also mean "to stop" or "to suppress". A storm, fever, and pain can abate; however, "interest declines". People abate a nuisance, terminate a controversy, suppress a rebellion, curtail or reduce production when there is a surplus. 1. An interruption in the intensity or the amount of something: There was finally an abatement of the violence in the attacks by the enemy forces. 2. Diminution in amount, degree, or intensity: The loud talking by the couple in the next room at the hotel came to an abatement when Mrs. Donald in the neighboring room knocked on the wall. 3. The amount lowered; a reduction: The store offered customers abatements of their products after the Christmas season. 4. A diminution, a decrease or an easing: In medicine there may be an abatement of pain or any other symptom or sign of a physical ailment. In the environment there may be abatements in the degree of pollution over various periods of time. 1. To hit with or as if with a club or thick stick: When Gary batted the ball that day, he set a record. 2. Informal, to produce hurriedly: Marie bats out a speech in a short time. 3. To discuss or consider at some length: Juan, Terry, Janet, and Doris were batting the idea around. 4. To wink or to flutter: Shirley, the little girl in the store, bats her eyelashes in a cute way. 1. A mixture of different things; such as, flour, eggs, oil, sugar which are cooked and eaten or that which is used to cover food before it is fried: Edna prepared a tasty pancake batter for breakfast. Tim was dipping the chicken pieces into the batter, covering them with flour, and then frying them. 2. Baseball players who try to hit the balls that are pitched at them: The pitcher walked the first batter, but the second batter hit the ball for a home run. 1. Subjecting someone or something to a strong attack: The storm was battering the coast with strong winds and rain. For centuries, those mountains have been battered by wind, rain, snow, and ice. 2. A situation in which someone is repeatedly hit: The boxer forced his opponent into the corner and battered him with a series of hard punches. 3. To severely criticize, to defeat, or to setback: Justin was battered by many citizens of the city for suggesting that taxes would be increased if he were elected as mayor. 4. To cover food in a liquid mixture of milk, flour, and eggs; and then to fry it: Dan was battering the pieces of fish and frying them for dinner. 1. Beaten; bruised, broken, impaired by beating or wearing: The battered people in the boat were thrown around during the storm on the lake yesterday. 2. Damaged; especially, by hard usage: Jerry wore his old battered hat when he went for a walk. 3. Beaten repeatedly with heavy blows: Last night when Justin had got off the bus, he was battered by street thugs. 4. Damaged by blows or hard usage; such as, a battered car: Teresa recently sold her battered car and bought a used car which was in better condition. 1. An attack that badly injures someone because that person was hit so many times: The ambulance had to take Jonathan to the hospital because he received a terrible battering during the boxing match. 2. The term is used in a figurative sense: That political party is expected to take a battering in next year's election. Some businesses have taken a battering this year. An engine used in ancient times to beat down the walls of besieged places (forts, castles, etc. ): A battering ram is a device that originated in ancient times to break open fortification walls or entrance ways. 1. A large-scale fight between armed forces involving combat between armies, warships, or aircraft: This military conflict was one of the famous battles of the war. 2. A drawn-out conflict between adversaries, or against powerful forces: There is still a prolonged battle going on against malaria. 3. An intense competition: There have been political battles of wits among those who are running for President of the United States. 4. Etymology: from Old French bataille, from Late Latin battualia, "an exercise of soldiers and gladiators in fighting and fencing"; from Latin battuere, "to beat". 1. To fight with weapons: The two armies were battling for control of the bridge. 2. To struggle or to try very hard to accomplish something: Martha's basketball team battled to the very end to win the game. 3. To fight or to argue with another person over something: Joyce and Jack battled over how the money was to be spent. 4. To fight, compete, or to argue with someone or others to achieve an objective: The two university teams are scheduled to battle each other for the championship. 5. To try to defeat or to stop something: Many firefighters arrived to help battle the brush fires. 1. A word, a phrase, or a sound that is shouted by soldiers in a battle: Their battle cry was, "Down with the pigs" as they moved forward. 2. A phrase or a saying that is used to make people support a cause, an idea, etc. : The presidential candidate shouted his battle cry to the people at the rally: "We can do it, yes we can". 1. To attempt to destroy or to control something considered to be harmful: Terry learned that exercise can combat pain and stress. 2. To resist or to oppose (to beat or to defeat) someone or something actively: The government has been combating rebels for months. 1. Anyone who attempts to destroy or to control something that is considered to be harmful: There are many combatants who want the government to take measures to decrease pollution. 2. A person, group, or country that fights in a war or battle: Gloria's country was a major combatant in the last war. Anyone who has or shows an excessive willingness to fight or to argue: Steven has a combative attitude that makes it very difficult for others to work with him. 1. An indication that something may, or may not be, true or real: Whether the politician's report is accurate is most debatable. 2. That which is liable to be questioned or disputed: It's debatable whether this tax cut is actually a benefit to very many people. Showing page 1 out of 2 pages of 23 main-word entries or main-word-entry groups.